BMW E24s/E28s/E30s, classic Minis, Jaguar XJSs, Porsche 924s, 944s and 928s - all can be found in droves sitting on a disused airfield in Bedfordshire. Some probably won’t take much to get back to good working order, all will have valuable parts, and none of them can be touched. We’re talking about the results of the UK Government’s 2009 scrappage scheme, which enabled people to trade in their old car to be crushed - so long as it had a valid MOT - to get a £2000 discount on a new one. The motivation was to breathe some life into the then-troubled UK car industry, and replace old, polluting vehicles with much cleaner new ones. The problem? 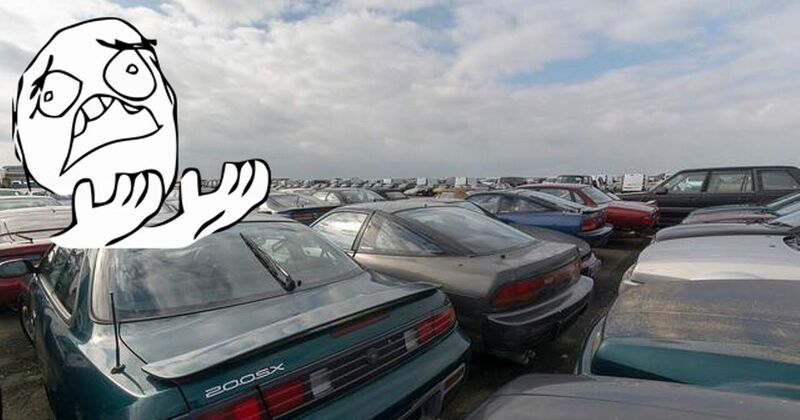 Many of the 392,227 cars scrapped simply did deserve to die. A full list of the cars taken off the road for the scheme was published a year and a half ago, and while that was depressing enough then, seeing images of a lot of the cars in question is pretty hard to take. Thousands of vehicles have not yet been crushed, and an urban explorer recently snuck into a disused airfield in Bedfordshire where many are kept, posting what he saw on Facebook. While you look through the set - and this additional one here - just remember: by law, these cars, many of which will have been perfectly roadworthy upon arrival, have to go to the crusher. Not a single part can be saved. And all so a bunch of people could get a moderate discount on a boring econobox (apparently Kia did quite well out of the scheme…).